OK so I am definitely not yet on the Pinterest bandwagon as yet (still waiting on that invite Pinterest! Hint. Hint.) however all I see and read about lately is Pinterest this, Pinterest that. So when Tom approached me regarding a guest post on the very topic, I said sure, I’d be happy to run it because I might learn a thing or two along with you guys! Entrepreneurs live for new tools right? That said… see below for the extremely thoughtful post by Tom, back for his second debut. When I first signed up for Pinterest a couple months ago, it was a sleepy social network that seemed destined for mediocrity. Several people I knew were using Pinterest to share photos with friends or seek out up-and-coming artists. 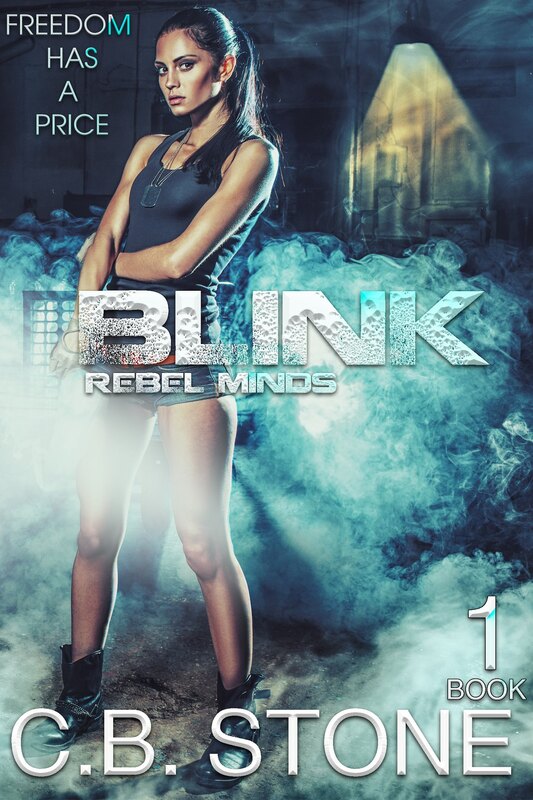 In general, images on the network were recycled in the small network, which seemed desperate for new content. Today, that same network drives more traffic in referrals than Google+, and is second only to Facebook in time spent on-site. 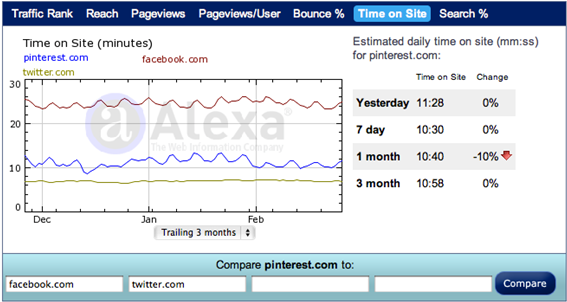 This graph from Alexa.com shows a comparison of time spent on Facebook, Pinterest and Twitter. RJmetrics writes that Pinterest retains and engages users 2-3 times more efficiently as Twitter did during a similar time in Twitter’s history. What’s more, the press is loving the social network’s success, and bloggers have been eating it up. Shel Holtz wrote an article on February 16th on PRDaily.com entitled, “It’s Foolish for Brands to Ignore Pinterest,” noting that at that time, there were 50 million-plus Google Blogsearch results for the budding social network, Pinterest. As I write this, the number of blog search results for Pinterest has jumped to well over 66 million. That’s about 5 million blog mentions per day over the 13-day period. It’s big news, and there’s lots of it. Pinterest is here to stay. For any entrepreneur interested in the tech world, it’s a dream to create a tool with pickup like Pinterest. But is Pinterest as disruptive a tool as, say, Facebook was? Does Pinterest rank up there with other disruptive technologies, or is it just a catchy social network? Will people use Pinterest for marketing? Or just for sharing? Looking at the data and hype about Pinterest can give us a look inside the real value of the Internet’s latest darling social network. 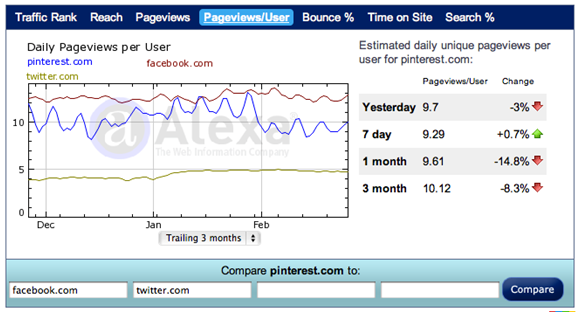 The big news at the beginning of February was the number of referrals Pinterest was sending to other sites. Pinterest drove slightly less than both Twitter and Google, but more than Google+, YouTube and LinkedIn, combined. Pinterest is proving to be a referral machine. And since the real draw of social media for business is the ability to market content in a unique way to get referrals back to their site, this is a real chance to capitalize. Of course, as with any of social network, we’ll see a barrage of articles about using Pinterest for business. Instead of asking How do you Twitter, we might start getting How do you Pinterest. But unlike Twitter, Pinterest could prove to be the real deal for referrals. 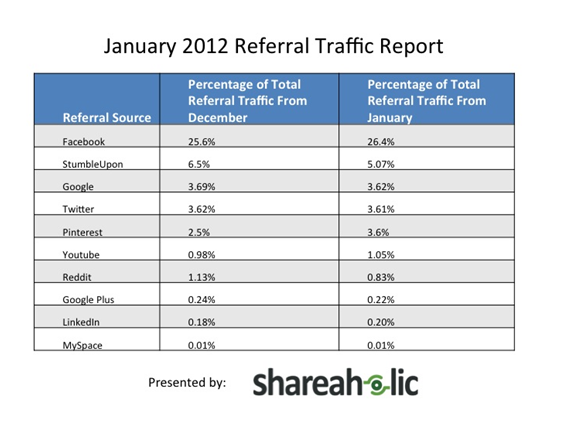 Facebook claims the top referral spot, sending 26.4% of total referral traffic, with StumbleUpon in second at 5.07%. The biggest takeaway from this chart is that Google, Twitter and Pinterest are all about tied for 3rd place with 3% of total referral traffic. With Pinterest user base growth, look for that number to increase. Facebook is the shining example of the largest, most engaged user base. None of the other social networks come close to the engagement numbers that Facebook boasts: highest in referrals and highest in time-on-site. 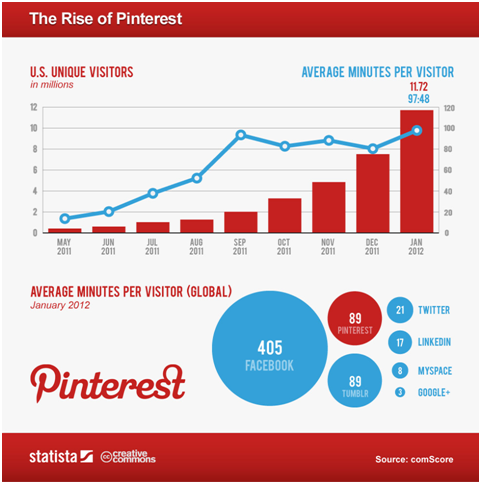 But besides Pinterest’s rapidly expanding user base, the average time-on-site per visitor has grown just as fast. Pinterest users are tied with Tumblr users for the most average time-on-site per visitor, albeit both remain well behind Facebook. ComScore reported that Pinterest was one of the fastest sites in history to hit the 10 million monthly unique visitor mark. The site has only been around for a couple months: It’s now one of the most popular sites on the Internet in the United States. With all of this data that’s been reported over and over about Pinterest, what can we say about its future? Will Pinterest have an impact on the Internet? So far, what Pinterest has had is an impact on our consumption of news: it’s been in headlines everywhere. But it will also become an outlet for marketers, as we can see from the referral traffic data. Brands will begin to leverage Pinterest for that referral traffic. When a social network is considered in brand marketing strategy, you know it has made an impact. As far as technology goes, however, Pinterest has found a place like few other social networks. It has carved out a niche from existing social networks themselves. Like Twitter snatched up the real-time news niche from Facebook (which resulted in Facebook integrating more real-time news features) Pinterest has grabbed another slice of the social network pie. Social networks will continue to become more niche oriented, but is there room for continuous growth in the number of social networks? Even after stripping out a niche market like Twitter and Pinterest have, is there added value for consumers in a constantly growing number of social networks? Pinterest’s impact on the Internet is as the place to go to share photos, images and video: it’s a new take on the social sharing network. That’s why it has had the pickup. People like sharing photos, and Pinterest is the fastest and easiest way to consume and share images to date. However, what’s the tool that’s really going to change the Internet? Who has the idea for the next Google? Or the next Facebook? Alrighty ladies and gents. If you found this post insanely useful, do share with your buddies. Or here’s a thought.. Pin It! You can do either of those things via the share buttons kicked off to the left of this post. In the mean time, I’ll kick off comments with a question of my own! See below. Thomas Samph, a graduate of Boston University, is a writer at Grovo.com. He recently moved back to the United States after living in France for a year where he was teaching English, working in a bakery and freelance writing. He currently lives in New York.